Reviews / Miscs / Review: ‘G.I. Joe: Rise Of The Cobra’ = OMG, Win! I’m going to get right to the point. 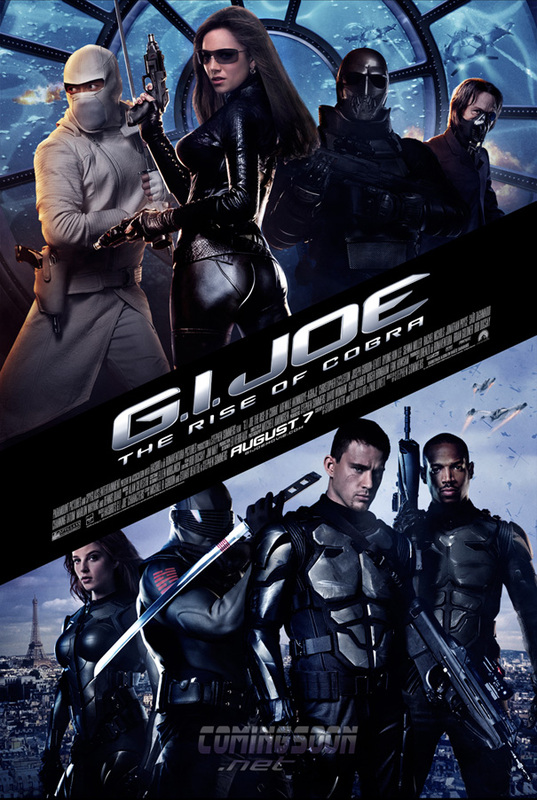 I loved the GI Joe movie and it’s not because I adore Ray Park nor is it because I used to pretend I was Scarlett when I was a little girl who barely knew English. I know what the reviews are. I know what they scored on rottentomatoes.com. Ask me if I care about the opinions of people I don’t know. I’d also like to point out that I don’t take deteriorating vegetables very seriously. That’s right. It was so nice, I saw this bad boy twice. So growing up I didn’t know much English but you don’t need a grasp on language to figure out what your favorite character’s name is and who the bad guys are. You also didn’t need to know what people are saying when it’s time for action. This much I knew as a little girl. 1. Despite wanting a tank for a car when I was little, I don’t think I’d want to be stuck in one all day long. Why a tank instead of the pink Corvette my Barbie had? Easy. I hated traffic even then (I was a speed demon in training) and figured that if I had a tank, I could make people get out of my way really fast. I’m all about results, people. 2. I have a horrible sense of direction. As in, wherever I’m facing is always North. I don’t care what your compass says because it’s broken. But you know what’s weird? Stick me in any casino, let me walk around once and I’ll never get lost. I rock. 3. I don’t know if the military would like me very much. By the time I graduated high school, they gave me my very own squad to lead around. That was awesome. I could’ve made them do squats, jumping jacks, endless laps around the track…but it was hot, I was tired and I had a mountain of AP homework to tackle. Therefore, I made them do the bare minimum and let everyone out early. I don’t know how that would translate into the Real World military (I’m guessing the answer would be “not very well at all”) but all I know is that my squad loved me and never let me down when it was inspection time. I so rock. As you can see, my childhood cartoons influenced me waaay into my adult life. This is why I was so excited when I heard G.I. Joe was going to be an actual movie. Having said that, I now know better than to expect too much from movies that try to translate beloved comics and games from their respective media on to the silver screen. The first X-Men movie killed that for me. However, I will say the Wolverine movie kind of rekindled my love for the franchise after they bastardized it the first few times around. Can anyone say Daniel Henney and Ryan Reynolds? Before I get into the reasons why I loved the movie, I will briefly discuss the parts I found lacking. I thought it was always Duke, Snake Eyes and Scarlett but that’s not really the case in the movie. Instead, there’s something a-brewing between Ripcord and Scarlett but you can kind of see her affection for Snake Eyes in one scene. As for a possible twinge of the non-platonic, I could’ve sworn I heard a hint of jealousy when Scarlett almost snarled “What’s he doing with HER” when Duke was seen carrying the Baroness out of the exploding Cobra compound. Things that make you go “hmmm…” Maybe this will be explored in the sequel that I am smelling. And where the hell is Lady Jane?! You know, I think Channing Tatum makes a great Duke. He’s got that whole All American appeal with the chiseled face and what not. However, I think he could’ve either put in more effort into the role or…something. I don’t know what it is. There’s something lacking that I just can’t put my finger on. The cast overall I think was pretty good. In the sequel (I’m so hoping there’s gonna be one. Can you tell? ), I’d like to see them either come off with better rapport or something because I was disappointed by the lack of cohesiveness. You know what I did like? Brendan Fraser’s cameo during the orientation/testing sequence. Damn, that boy’s got some serious muscles. No sign of Dudley Do-Right here. No, sir. He totally redeemed himself for reminding me of that movie in the role of General Hawk (does nobody else think Dennis Quaid and Sam Neill kind of look alike? Or is it just me? Anyone? …Bueller? )….although some of the dialogue they wrote for him could’ve been less corny. Actually, that goes for the whole movie. While I cracked up almost every time Marlon Wayans opened his mouth, there were quite a few times when I cringed at a few of the lines those poor actors had to utter. One line that made me cry tears of mirth was when Ripcord says to Scarlett “I’m nasty with it” during the training/try-out sequence. That part was actually one of my favorite parts of the movie. For some reason, every time he made a funny face or said something awesomely hilarious, I kept picturing “White Chicks” in my head. God, I love that movie…makes me laugh every time I see it. Perhaps the next time around, it’ll be better….but then again, who the hell goes to a summer blockbuster bang-bang-KABOOM movie expecting killer dialogue and/or a mind boggling twist at the end?! “Not I”, said the fly. Amen to that. Great review…looking forward to watching it!